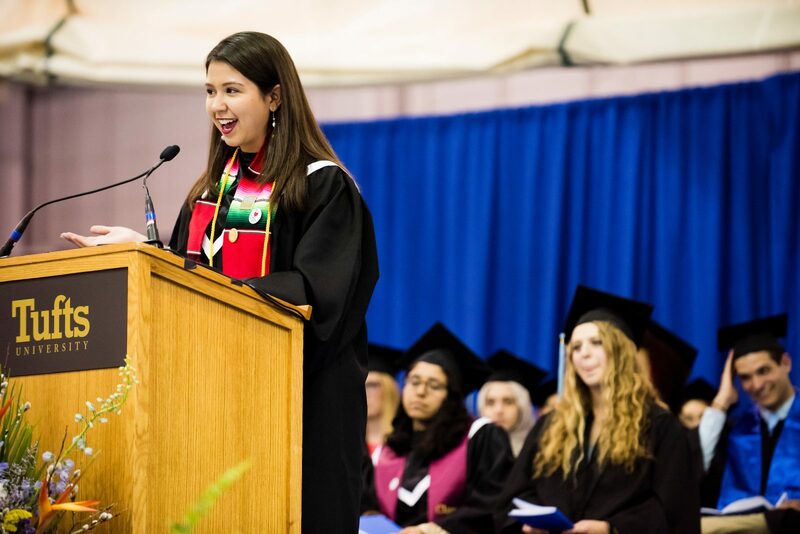 Anna Del Castillo, A18, the Wendell Phillips Award recipient and class speaker, gives her address to her fellow graduates and guests during the 154th annual Baccalaureate service on the eve of Commencement at Tufts University on May 19, 2018. The Senior Baccalaureate Speaker is the recipient of the Wendell Phillips Award, established in 1896 to honor Boston’s great orator and advocate. The award is given annually to a senior who demonstrates both marked ability as a speaker and a high sense of public responsibility. The speech is intended to deliver a social justice message for our time. Before I begin, I want to acknowledge the Wampanoag people of whose lands we sit on. May we continue to be aware of our position on this land and support Native resistance efforts. Good afternoon students, faculty, staff, and family members from near and far, I am so incredibly honored and humbled to be delivering this year’s Wendell Phillips Address, and to be honest a bit nervous. In the weeks leading up to this moment I felt immense pressure... what words of inspiration could I offer to a gathering of some of the most brilliant, passionate, and intelligent people I have ever met? I have admired so many of you during these four years...people like Maya Pace you teach so many of us about self-love and what it means to care for others, and Lauren Louks and Zoe Miller you somehow balance being captains of the varsity tennis team as well as all-star students, and Max Hornung, you bring so many of us joy with your music and sold out S-Factor concerts, and Lucy Zwigard you address food insecurity on this campus and in surrounding communities by packaging weekly meals and dropping off food in the campus center, and Anna Francella you not only take the world's best selfies but you also work tirelessly to support BLAST students on campus, and Benya Kraus you alone spent days single-handedly putting gender neutral bathroom signs on every single-stall bathroom on this campus and you advocate for students even when if it means sacrificing your grades, social life, and time. It is this community and many of the people sitting in this room who have shown me radical love and critical compassion. You have taught me how to call out in order to call in and have shown me what fearless honesty looks like. Thank you for what you teach me and for all that you give to this world. So in this last moment where we can sit together as a class, let's dance and sing and celebrate all that we have done! May the grace of the creator carry you, may you feel protected by the strength of your being. This strength has carried me through four years, four years that saw individual and collective change. In 2014, at the start of our Tufts Career, Lil Jon’s “Turn down for what” played at literally every single basement party, the great Jumbo statue that now sits in front of Ballou Hall was nowhere to be found, and the Rez didn’t yet serve cold brew on tap. Time has passed, and we, along with our society, have experienced profound change— some good and some bad. In these four years, we have mourned with our brothers and sisters around the world who faced, and who continue to face, injustice and exploitation at the hands of our own government. We witnessed the inauguration of a racist and xenophobic President. On our own campus, we have felt a fierce divide as contentious issues turn friends into strangers. As seniors, preparing to leave these comfortable Medford streets and off-campus houses that charge way too much for basements without washing machines--(pause) Many of us look uncomfortably at the world we inherit. A world filled with police brutality, gun violence, racial bigotry— threatened by the ever-present dangers of nuclear war and global warming. I think my grandmother has an answer for all of us. This past summer, my abuela came to Mississippi to visit my family. Panchita Francisca Villafuerte Del Castillo is a first-generation immigrant to the United States, one of the best marinera dancers in the world, and a living source of joy and wisdom. Towards the end of our visit, I asked my grandmother if I could record her story so that I could someday pass down the history of our family to my future children. As we sat at the kitchen table with coffee and bread, she began to talk about her life in Bolivia--how poverty and economic crisis forced her to move to Peru with her four young children. She packed up everything and took her family to a new country with no job, no community, and no secure place to call home. This was a part of my family’s history that I had not learned until this kitchen conversation. Abuela, what did you do?! I asked her, so taken aback by her bold decision to move to another country where she knew no one and had no set plan for her future. In my confusion, my grandmother looked me in the eyes and said, “I survived” She used the little money she had to buy cooking supplies and sold small pasteles on the streets of Lima until she saved enough money to pay for her nursing certification in Peru. With the help of the community she built, she launched a successful career as a nurse and eventually moved to the United States. Being a brown immigrant woman in this country is hard as U.S immigration policies continuously strip immigrants of basic rights and human dignity. It is the way that my grandmother fought against these hardships and centered critical compassion in her life that I first learned about resistance. At 86 you can find my grandmother in nursing homes teaching her friends how to dance batchata and leading cultural learning programs. As an art activist, she writes poetry about nuestra comunidad Latino, our radiant Latino community. Through hardships, she never stops fighting for the rights of others and for her right to exist and thrive so that her grandchildren, so that I can thrive and be here on this stage today. I share this story because my grandmother taught me two seemingly contradictory lessons that when combined have the power to transform the world: resist injustice in every way possible and live with love. To live with love is to affirm those you care about in times when hatred tries so hard to prevail. To live with love is to cultivate kindness and embrace the things that unite us. To live with love is to smile at the person who serves you coffee and walk with your headphones off to appreciate the sounds of nature and the human chatter that surrounds you. To live with love is not to be complacent to the injustices occurring in our world. It does mean paying attention to the proclaimed peaceful intentions of the United States that result in devastation, and speaking out when Congress refuses to act after mass shootings like in Parkland, Florida. To live with love is to understand that appreciation and criticism are not mutually exclusive. As Tufts students, we would not be doing this institution justice if we dismissed the fact that I am one of the few Latina students on this campus, or that the majority of Americans make far less than what it costs to attend this university. Who is not on this campus right now? What faces don't you see sitting next to you? Critical compassion is the way that I choose to fight against injustice, but this is by no means how everyone goes about their work. I value my time at Tufts because I have been challenged and pushed by other activists who choose to advocate in different and equally powerful ways. The combination of all of our efforts has made significant waves and created lasting impacts on this campus and in our surrounding communities. I understand that many of us have different approaches to social justice and advocating for change, however, we are stronger and our work goes further when we choose not to isolate and shame each other, but rather celebrate and bring one another in closer. As we continue our journeys and attempt to find our place in the world, my hope is that we act on the fierce urgency of now, knowing that silence is not an option. And in times of struggle and uncertainty, I hope that we carry with us our joy moments, moments like gaining wisdom from midnight common room conversations, laughing over shared Pizza at Espressos, sledding down pres lawn after the first snowfall, finding a group of people who make you feel seen and held, watching hundreds of candles illuminate a dark sky on our first night at Tufts. May these joy moments sustain us and push us to do more. Class of 2018, May the reality of today be our call to rise up, to resist, and in each moment, to live with love and gratitude-- for this will carry us-- this will carry the world.